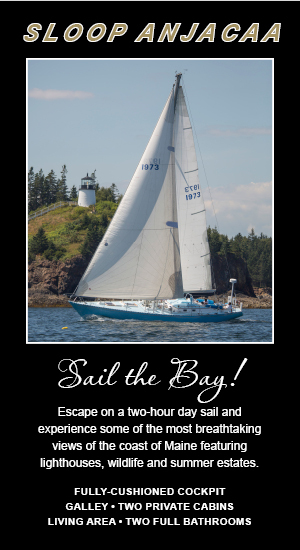 We are looking forward to the excellent forecast for the coming weeks for sailing on Penobscot Bay. We are now offering daysails and sunsets sails for two hours seven days a week on both Schooner Surprise and Sloop Anjacaa. Both boats are also available for charter so if you are planning a birthday party, anniversary, family reunion, or corporate event let us help you make it a special day to remember on board! We also offer catering and specialized menus. People often ask why the Surprise? We offer cushioned seating for all on board, a limited number of passengers allows our guests a more intimate and comfortable ride. Our schooner is also on the National Register of Historic Places and carries a fascinating history. What about Anjacaa? Anjacaa is great for small parties looking for a more private ride. She carries a maximum of six guests, and is good for couples looking for more space and fewer passengers on board. Anjacaa is also great for those looking for speed, she is swift in the water and great in both light winds and strong breezes. 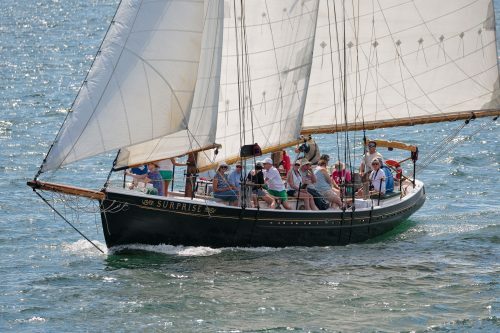 We have lots of special events happening this summer aboard both boats including full moon sails, sunset sails with live music and dessert, fireworks sails, race weekend on Anjacaa, Windjammer parade of sail in Rockland. Check out our special events page on our websites, and join us for a sail this summer!